Comvita Children`s Natural Lollipops combine the power of propolis with the effect of UMF Active Manuka Honey, for a natural therapeutic treat. These lollipops may help maintain the health of the mouth and throat. Available in packs containing 10 individually wrapped lollipops. Sugar, Corn Sugar, Active UMF 10+ Manuka Honey 1.19g (395mg per 1 lollipop, 3.95%), Water, Propolis Solids 45mg (15mg per 1 lollipop, 0.15%), Lemon Flavour, Menthol, Peppermint Oil. Bee propolis may cause severe allergic reactions in allergy sufferers. If irritation or swelling of the mouth or throat occurs, discontinue use and consult a healthcare practitioner. 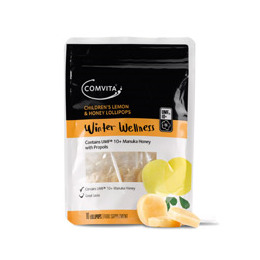 Below are reviews of Comvita Childrens Lemon & Honey Lollipops - 10 Pack by bodykind customers. If you have tried this product we'd love to hear what you think so please leave a review. I have been getting these for at least the last five years for my grandchildren and sore throats are a thing of the past the first thing they seek when they feel a tingle in their throat is a Lozenger great!!. Comvita Childrens Natural Lollipops combine the power of propolis with the effect of UMF Active Manuka Honey, for a natural therapeutic treat. These lollipops may help maintain the health of the mouth and throat.